Peppermint or mint tea is a favorite flavor for many regular tea drinkers. It is commonly associated with providing a cozy treat during warm weather. In addition to being quite flavorful there are also many benefits to drinking peppermint tea. Understanding these health benefits can help you take better advantage of peppermint tea so you can improve your health. Peppermint is considered a stomach healer that can assist with irritable bowel syndrome, nausea, stomach aches, diarrhea or constipation. People often find it easier to consume peppermint tea because it does not contain sugar like peppermint candies that may further irritate the stomach. Peppermint acts as a cooling carminative that helps to relieve pain in the digestive tract by helping gas to move through your stomach and intestines after you have eaten. In many cultures peppermint will be served after you have eaten to promote bile flow so your body will digest food more easily. Herbalists claim that peppermint leaves can create a tea that will help to keep nausea at bay and remedy a “jumpy” or queasy stomach that many people feel when travelling in a car, airplane or boat. The antispasmodic qualities of peppermint can help to prevent vomiting that often comes with nausea or stomach aches in these conditions. The analgesic properties of the tea can help to calm and relax the stomach and intestinal muscles that can help to get rid of irritable bowel syndrome, diarrhea or stomach cramps. Many people consume peppermint tea when they are suffering from the cold or flu because it is full of calcium, vitamin B and potassium that can give the immune system a boost. Some claim that sipping peppermint tea can help keep mild asthma cases under controls, though medical professionals doubt this information. These ingredients can help to relieve the symptoms of your illness and prevent you from getting ill in the future. Those with bad breath can sip peppermint tea to help encourage a more pleasant smell. Drinking peppermint tea on a regular basis is claimed to help to permanently rid you of bad breath symptoms that can be uncomfortable or embarrassing, but the science behind these claims is somewhat debatable. The taste and smell of peppermint are known to help relieve stress. Drinking peppermint tea is found to help people sleep more easily at night because of these stress-relieving properties. Some believe that this stress relief that comes with sipping peppermint tea is linked to the immune system boost that this beverage provides. Some claim that peppermint tea can suppress the appetite, which is helpful for those that are trying to lose weight. Others think that giving a baby peppermint tea to sip on can help to manage colic. Still others have found that drinking peppermint tea can help reduce the discomfort that is associated with headaches or migraines. Those that have gastroesophageal reflux disease or GERD may see an increase in their symptoms while drinking peppermint tea because this tea will relax the stomach muscles and the muscles of the sphincter. This can lead stomach acid to flow up the esophagus and aggravate existing symptoms. Drinking peppermint tea during pregnancy can cause the uterus to relax which may increase the risk of having a miscarriage. There is not currently scientific evidence that specifically notes that drinking mint teas will increase this risk, but those that have a history of miscarriages should take caution and abstain from drinking peppermint tea while they are trying to become pregnant or during pregnancy. It is also advised that people who are breastfeeding avoid drinking mint teas as this can be dangerous for infants and small children. In some cases it has been found that peppermint tea has negatively interacted with other medications that individuals have been taking. If you are taking any form of over the counter or prescription medications you should take the time to confirm with your doctor regarding whether or not it is safe for you to consume peppermint tea, particularly if you plan on drinking this tea regularly as part of a health regimen. 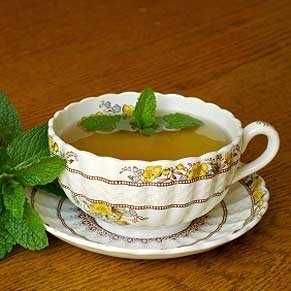 If you have any type of menthol allergy you should avoid drinking mint tea as this increases your risk of side effects. You should also avoid drinking peppermint tea if you suffer from asthma as it can increase your symptoms. Overdoses of any herb can have adverse effects on your overall health, and this is the same for peppermint. If you consume an excessively large amount of peppermint it can cause cramping, diarrhea, drowsiness, muscle pain, slow heart rate and tremors. An overdose of peppermint is extremely rare, but to prevent this condition you should take care when you are preparing your peppermint tea. Check the quantity of leaves that are being used in each cup to determine if your dosage is within the recommended limit. Ideally, each mug of peppermint tea should contain around one gram or tablespoon of peppermint tea leaves for every 150 ml of water that is being used to boil the tea. You should not drink more than two to three servings of peppermint tea each day to avoid potential side effects. The video listed below offers instructions on how to make a cup of peppermint tea that will maximize the potential health benefits associated with this beverage, but not a serving so strong that it increases your risk of side effects. Do Bananas Make You Constipated?